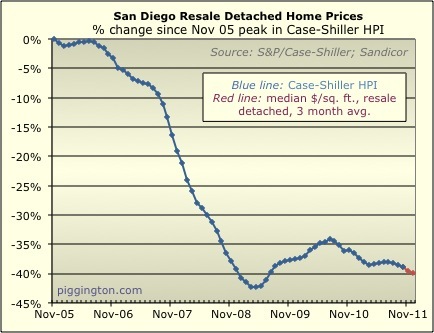 The estimated HPI was down (from the actual HPI) by .7% for the month and 5.5% for 2011. Closed sales jumped, as usual in December. 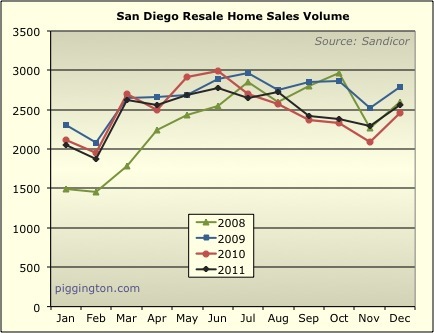 Sales were up 3.8% from December 2010. 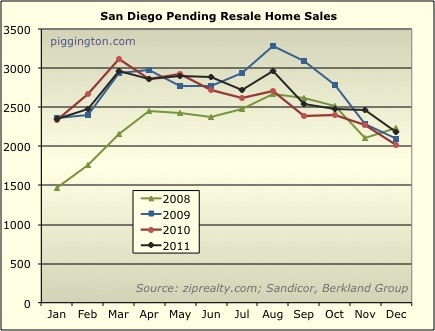 Pending sales declined, also typical in December. Pendings were up 8.2% from a year ago. 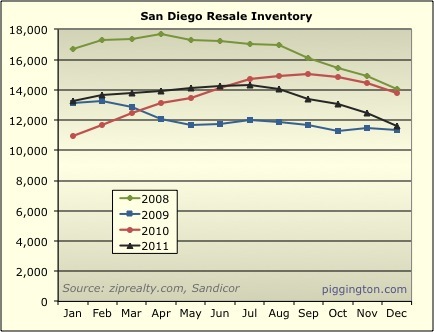 Inventory was down for the month and ended the year 15.9% lower than in December 2010. This stat, which is very important because it combines supply and demand into one figure, was substantially lower than a year prior, by 22.2% to be exact. So we enter 2012 with a fairly different setup, supply and demand wise, (and thus a more positive outlook for prices) than we entered 2011. On a gloomier note, that higher demand is taking place in an environment of lifetime-low mortgage rates... if (when, in my opinion) that prop is removed, the housing market will have to fend for itself a bit more. Of course, that could be a way off. In the meantime, those waiting for a big price decline are likely to be disappointed. Submitted by sdrealtor on January 17, 2012 - 1:50pm. I guess I'm often the contrarian around here but the statistics often dont tell the reall story as they are backward looking and based upon homes sales that closed a few months ago and went under contract a month or two earlier than that. 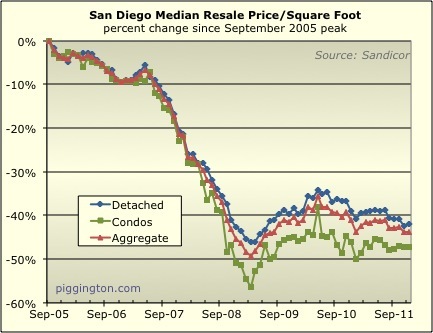 On the SD coast I see the real possibility of a 5 to 10% drop between last Fall and this Spring. Nice well priced homes are sitting without offers all over the place. 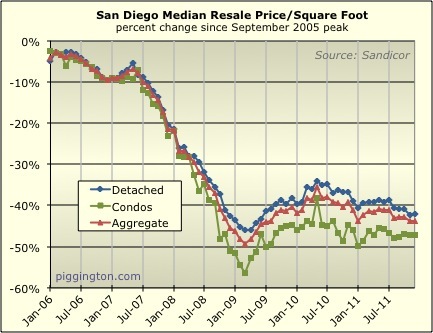 If you consider 50 to 100K price decline on a 500k to 1M house a big price decline you may not be disappointed. If you are looking for more than that, I agree you will likely be disappointed. Submitted by Rich Toscano on January 17, 2012 - 2:43pm. Submitted by sdrealtor on January 17, 2012 - 3:18pm. You are welcome Rich and you know I'm not just trying to take you to task. You just interpret stats which is what you have access. to. I just report what I see and that often doesnt line up with the statistics and usually preceeds which way they end up going any way. Submitted by urbanrealtor on January 17, 2012 - 4:38pm. I am seeing that in a major way in my pockets down here. Cheap inventory is the exception. They(eg: 1-bedroom conversions) appear to be selling quickly and for more than before and often more than asking. Submitted by Rich Toscano on January 17, 2012 - 5:37pm. You know what's funny, at first I wrote that as "In the meantime, those waiting for a price crash are likely to be disappointed." I changed it at the last minute because I didn't want people to think I was predicting a crash once rates go up (due to the "in the meantime"). I was trying to be more clear, but I guess I failed... in any case, hopefully that gives a bit of flavor of what I was actually trying to say. Submitted by urbanrealtor on January 17, 2012 - 8:17pm. So what you're really saying is that the market is crashing in the next week and soon we will be needing to trade salt and wheat? Submitted by desmond on January 18, 2012 - 9:47am. 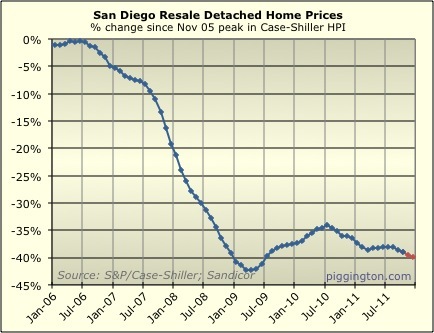 I do not remember anybody calling for home prices to "crash" on this board. There are a few that have called for prices to continue to fall, the self proclaimed "contrarian" is not one of them. 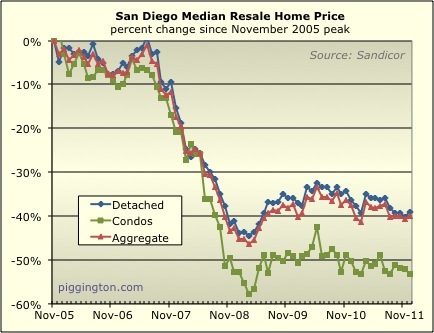 I guess if you claim prices will not "crash" the continued erosion of home prices does not look so bad. I will say that sdr's call of price drops is shocking, not that he called it, but the drops are dramatic. You can have all the investors you want buying up low priced homes, unless the move up market starts churning than good luck. Submitted by Jazzman on January 18, 2012 - 1:28pm. I don't believe there are many who expect big declines, but 5-10% doesn't seem beyond the realms of possibility. Pre-foreclosures may also shape the supply trend down the line. 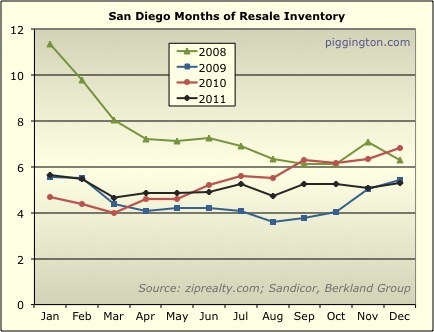 I'm seeing a steady build up in my area, and some brokers are anticipating a wave of REO listings this spring. Submitted by sdrealtor on January 18, 2012 - 2:53pm. I actually called for a 5 to 10% decline last year with most of that coming at the end of the year. It never came the first 9 months of the year and then it all came the last 2 months of the year. There still arent closed comps on this but its what I see which is usally a couple months ahead of the market and further ahead of the stats. With that said I think we are still pretty stable and that what I am thinking is coming is the last chance to grab a bottom. I could be wrong but so far I've been pretty spot on. Submitted by urbanrealtor on January 18, 2012 - 5:35pm. That is consistent with my experiences this past year as well.